Luxury watchmaking brands are coming out with collections that feature thin watches, the color blue, a focus on complications, right angles and smaller sizes. Given the consistency in which these brands are flattening their timepieces, ultra-slim timepieces will soon be less of a trend than an expectation. Not that we are complaining, the race to break ever more thinness records has given us some truly stunning and amazing slender new timepieces. Leading the pack thus far is Piaget, with its thinner-than-a-coin Altiplano Ultimate Concept, a concept timepiece that is just 2mm in thickness. Five patents are pending for the Ultimate Concept, the world’s thinnest watch. Also, not yet for sale is Audemars Piguet’s new concept model, the world’s thinnest automatic perpetual calendar. The in-house 5133 movement is an amazingly 2.89mm in thickness, giving the Royal Oak RD#2 Perpetual Calendar Ultra-Thin a height of just 6.3mm. 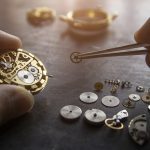 Bulgari also entered the race with the Bulgari Octo Finissimo Tourbillon Automatic, a triple record-breaker as the world’s thinnest automatic watch, thinnest automatic tourbillon and thinnest tourbillon. The flying tourbillon movement, the BVL 288 is only 1.95mm in thickness, with the entire watch coming out at just 3.95mm. Patek Philippe also introduced the first perpetual calendar in its Nautilus line with the white gold 5740G, while Vacheron Constantin’s Overseas Ultra-Thin Perpetual Calendar from 2016 returns in a new pink gold case. There are a lot of brands that have a healthy stock of blue-faced timepieces for those who want to deviate from the white, black, or silver dials with something that is still elegant but a bit different enough to make it interesting. But its popularity has hit somewhat of a peak in 2018, thanks to brands such as IWC adopting the colour for half its 150th-anniversary collection, and Longines and Breitling pushing out several models in that hue. Brands such as Breguet and De Bethune have used the colour blue to celebrate renewal. For the former, its Marine models were revamped last year and white gold versions of this year’s Marine Ref. 5517 and Marine Chronograph Ref. 5527 come in a cool blue shade. The return of Zenith’s Defy Collection was marked by the high-frequency Defy El Primero 21 chronograph and Defy Lab last year, but its latest addition is the entry-level time-only Defy Classic which is a shrewd move to attract a wider audience to their collection. Richard Mille is still buy trying to make timepieces that will eventually withstand the apocalypse – or something rather close to that – to dedicate a whole collection to one shade, but the RM 53-01 Tourbillon is doing its part. The ultimate polo watch has striking light blue accents that highlight the unusual suspended movement, with a matching crown and strap. Complications are what really set haute horlogerie apart from the time-telling hoipolloi. And much to our delight, this year’s offerings are positively packed with them. 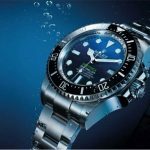 Blancpain’s popular diving line, the Fifty Fathoms, occasionally welcomes extras like moonphases and chronographs, and it did so again in 2018 – via novelties like the Bathyscaphe Quantieme Annuel. It’s the first annual calendar watch in the Fifty Fathoms line, and uses a movement based on the existing Calibre 1150. Elsewhere, Patek Philippe’s sporty, younger Aquanaut family welcomes its first chronograph, borrowing the movement from the Nautilus Ref. 5980. Tudor’s own diving watch, the Black Bay, gets a GMT function this year (a first for the brand) and its styling makes it a serious rival to big brother Rolex’s GMT-Master II and its Pepsi bezel. Impressive things have been going on under the hood as well, as seen in the Baume & Mercier Clifton Baumatic. It’s a time-only watch, but arguably one of the most advanced ones out there, thanks to its silicon balance spring, silicon escape wheel and lever, and optimised “Powerscape” escapement design for more efficient energy transfer. From the independent end, we have the Ulysse Nardin Freak Vision, a regular production version of its concept watch Innovision 2 from last year, boasting its unusual silicon and nickel escape wheel, Anchor Escapement and floating pallet fork. Many brands are returning to more classically designed (read: round and plain) timepieces, but we’ve noticed that the fairs’ more interesting releases tend to be angular. Brands like Cartier and Chanel have angular watches that have achieved cult status, namely the Cartier Santos and the Chanel Premiere. The former has gone through a rather massive revamp, and the new generation of Santos watches now has slimmer profiles, more ergonomic cases, easily changeable straps and bracelets, and anti-magnetic movements. Chanel’s 2018 eye candy is the Boyfriend Skeleton, which shares the same perfume stopper-inspired case shape as the Premiere, but houses a beautifully geometric, ADLC-coated skeletonised movement. Rado also has a rectangular watch in its past, and to ensure it doesn’t fade into obsolescence, released the Rado Tradition 1965. There are three models – two in 35mm cases and one in 44mm – in limited editions. Others preferred getting an outsider’s perspective. Updated for 2018, the Hermes Carre H was designed by award-winning designer and architect Marc Berthier in 2010. And just last year, LVMH partnered Bamford Watch Department, a company that specialises in personalisation. One of the fruits of that partnership is the Tag Heuer Monaco Bamford, which updates the Calibre 11 Monaco style with bright blue accents and a carbon case. Finding rugged tool watches that don’t look disproportionately large has always been a challenge for those with smaller wrists. Thankfully, the options are growing and, surprisingly, Panerai is one of the watchmakers offering more diminutive tickers. Better known for hulking 45mm and 47mm watches, the Italian brand is rolling out a range of Luminor 3 Days Automatic watches in 38mm cases. These are the first Panerai watches to go below 40mm, and are now the smallest ones it has made. Breitling also has a 38mm watch this year – the Navitimer 1 Automatic 38 – and it’s marketed towards women. But even those who can pull off larger sizes may find daintier dimensions more appealing because it recalls a simpler time. Indeed, the supersizing of watches is a relatively recent trend, and those made decades ago rarely pushed past 40mm in diameter. The Rado Captain Cook didn’t in 1962, and its limited-edition reissues from last and this year, known as the Captain Cook MKII, still retain its 37mm size. Omega had the same idea when it unveiled the Seamaster 1948 Limited Editions with elegant 38mm stainless steel cases that have domed, silvered dials. Tudor even went as far as to launch a completely new collection – the 1926 – to honour the simple elegance of years long past. Designed for men and women, it comes in a range of dials, materials and sizes, with the smaller ones at 39mm, 36mm and 28mm. Matheu’s Fine Watches & Jewelry has been providing quality products and professional services to the metropolitan Denver, CO area since 1951. The very first watch repair and service facility ever opened in Colorado. Dan Matheu, watchmaker, pioneered watch repair and services in Colorado. Today, Scott Matheu is at the helm steering Matheu’s Fine Watches & Jewelry. With his vision, Scott opened a watch store in Highlands Ranch and has made Matheu’s Fine Watches & Jewelry not only one of the largest watch stores to provide watch repair in Denver, CO but also the entire state. Whether you need watch repair in Denver, CO, watch engraving, or even if you have an antique watch that you would like appraised, you can count on Matheu’s Fine Watches & Jewelry to provide you with superior service each and every single time. All of our watchmakers are factory trained and we have CW21 Certified by the American Watchmakers and Clockmakers Institute (AWCI) on site. This certification has the most stringent standards for watchmakers performing repair, restoration, and service work on watches. With one of the largest service centers in the metropolitan Denver, CO we are not only able to provide watch repair in Denver, CO but to the entire 50 states as well.